Trend-spotters at 4imprint are bringing new shapes, fresh colors, added functionality, comfort and convenience to new and exclusive promotional products for 2008. The result: More imprinted products sport stylish shapes, updated functionality, improved comfort and convenience and on-trend colors. Totes and bags are just one example. "With totes and bags, we really have seen a base color shift from the usual black to a more neutral grey. The resulting color combinations are softer on the eye, more casual and make logos and imprint colors really pop," said Suzanne Worwood, 4imprint Vice President Merchandising. "With bags, form follows function. 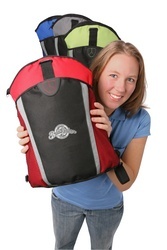 For example, the new Double-up Tote provides convenient, flexible carrying options for trade show attendees. The Shield Mono Pack is much the same, but for outdoors enthusiasts." These updated design and functionality enhancements make the giveaways, customer thank you gifts and employee incentives even more desirable. Increased usefulness creates added visibility for a company's logo. "Enhanced design details make the totes incredibly useful, so people keep reaching for them, even after the conference or trade show is over," Worwood said. -- Double-up Tote--With an over-the-shoulder or across-the-body strap and a die-cut handle option, this ergonomically friendly bag will really make an impact at conferences and trade shows alike. It is available in royal blue, lime green, charcoal grey and orange. -- Shield Mono Pack--Another 'strappy' favorite, the Shield Mono Pack's carrying strap can be moved to either bag corner, giving a unique twist to a traditional sling. This 4imprint exclusive pack is available in gray, red, green or blue. -- Stowaway Cube Cooler--This 4imprint exclusive is perfect for the outdoorsman or woman. This outdoor picnic cooler holds a 12-pack of your favorite beverage and has plenty of storage space for other necessities in its outside pockets. The cooler is available in moss green or royal blue. -- Escape Sport Duffel--The Escape Duffel is the ideal giveaway for sports clubs, company picnics, campers or families. With a large zippered main compartment and full-front slash pocket, this 4imprint exclusive carryall is available in black, lime green and royal blue. The functionality, comfort and convenience trends seen in totes and bags are also influencing other promotional items, including coffee mugs, pens, polo shirts, and more, allowing organizations to present their brands in a modern way. To check out other exclusive 4imprint products, visit http://www.4imprint.com/exclusives.